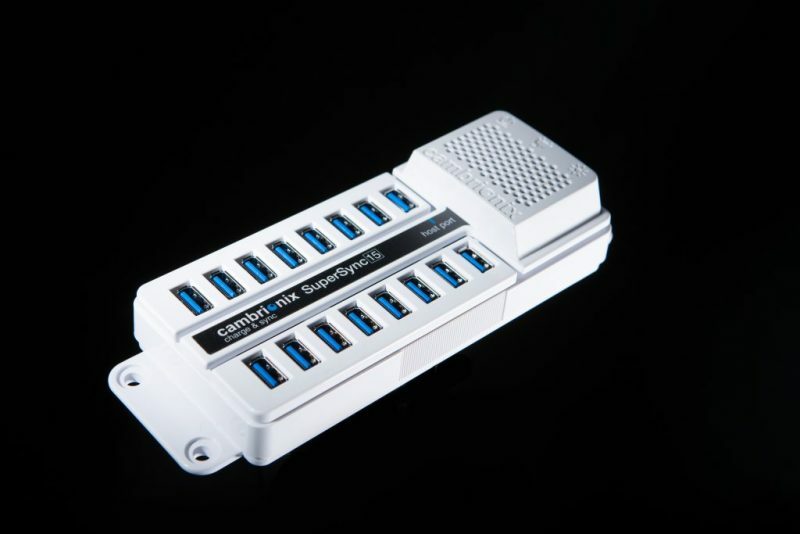 The DS-SuperSync15 is an advanced universal USB 3.0 hub that can charge and manage iOS and Android devices. It takes full advantage of USB 3.0’s 5Gbps data transfer and provides 2.1A high-current charging for each connected 3.0-capable devices. Compact, reliable and safe, it is perfect for production test rigs, mobile software development, retail displays and any place where taking advantage of USB 3.0 capabilities applies. It is fully compatible with Cambrionix’s Live Viewer software and open API that displays and permits control of each port’s connected devices. And it permits for field-updatable firmware as new devices and applications are introduced. The DS-SuperSync15 Managed Hub allows the user to monitor and control multiple, important aspects of port operation via an API or GUI. Includes an update “host” port for syncing and firmware: User-updatable firmware makes this future-proof. Fully compatible with Cambrionix’s open API and Live Viewer (which allows users to control each port and their connected devices. It is also compatible with software developed to work with its API. FCC Part 15 tested and marked. DS-SuperSync15 offers ESD protection, over-voltage protection, over-current protection and over-temperature protection and complies with the latest EN60950 safety requirements for ITE. Housed within a UL94-V0 specification fire enclosure. Operating ambient temperature: 0 to 35 Degrees Celsius. Relative humidity: 5% to 95% non-condensing. 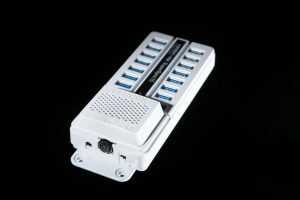 PSU AC Input: 100-240V / 3A Max / 47-63Hz. DC Output: 5.2V / 2.1A per USB port.